9 February 2018 | Federation Training has announced that its Managing Director of 20 months, Jonathon Davis, will leave the institute on Thursday 15 February 2018, to care for his ill wife. Grant Radford, currently acting CEO at Chisholm Institute, will take over as interm CEO on 19 March. Until then Virginia Simmons, formerly CEO of Kangan and Chisholm Institutes, among other roles, will fill the role. 30 January 2018 | The Commonwealth Government has released discussion papers on unduly short VET courses and training product reform. The consultation paper on unduly short courses follows ASQA’s report in June 2017 that recommended defining and setting of mandatory training requirements under certain circumstances and related obligations for providers. ASQA made three recommendations. 26 January 2018 | 895 Australians have been recognised with Orders of Australia on Australia Day 2018, 641 In the General Division (basically, civilians). As always, members of the tertiary education sector featured strongly in the honours list, with 119 awards (about 19% in the General Division), particularly in the upper categories. People associated with the tertiary sector received 11 out of the 16 Companion awards (68%), 27 out of 68 Officer awards (40%), 62 of 170 Member awards (36%), for 40% of the higher awards (a proportion which has actually increasing considerably over time) . In the most common category, Medal of the Order, only 19 of 387 awards were tertiary sector related people (5%). 17 January 2018 | As the main round of university offers go out to prospective students across the country this week, Universities Australia says federal funding cuts will leave a projected 9,500 places unfunded by Government in 2018. Chief executive Belinda Robinson said the $2.2 billion cut announced just before Christmas had put Australia’s universities between a rock and a hard place. 16 January 2018 | Some 52,973 Victorian Tertiary Admission Centre (VTAC) applicants received main round offers on 16 January 2018 for undergraduate courses in 2018. Since November 2017, VTAC has also issued 2,547 offers to international Year 12 students and 5,833 early offers. As a result, over 61,353 individuals have received at least one offer at this point, with several more offer rounds to come over the next month. Overall, this is a slight decrease from 2017. 16 January 2018 | The Australian Skills Quality Authority (ASQA) has cancelled the registration of Study Group Australia Pty Limited as a provider of vocational education and training (VET) services, for significant non-compliance with the requirements of the VET Quality Framework. Study Group Australia trades under multiple business names including ACPE Academy, Martin College, Australian Institute of Applied Sciences, Embassy English, Taylors College, ANU College, Flinders International Study Centre, and Taylors Unilink. It would be reasonable to assume, as many people do, that the word university derives from the Latin universitas, meaning the whole, entire, and is related to the universality of knowledge and learning that notionally characterises a university. Reasonable but not quite on the mark. It actually comes from a contraction of the Latin phrase universitas magistrorum et scholarium, meaning a community of masters (teachers) and scholars (students). So from the earliest times, teaching and learning – the transmission of knowledge and understanding – have been at the heart of a university’s mission. Through the centuries, universities have further emerged as the primary agents of knowledge creation in societies through their research. 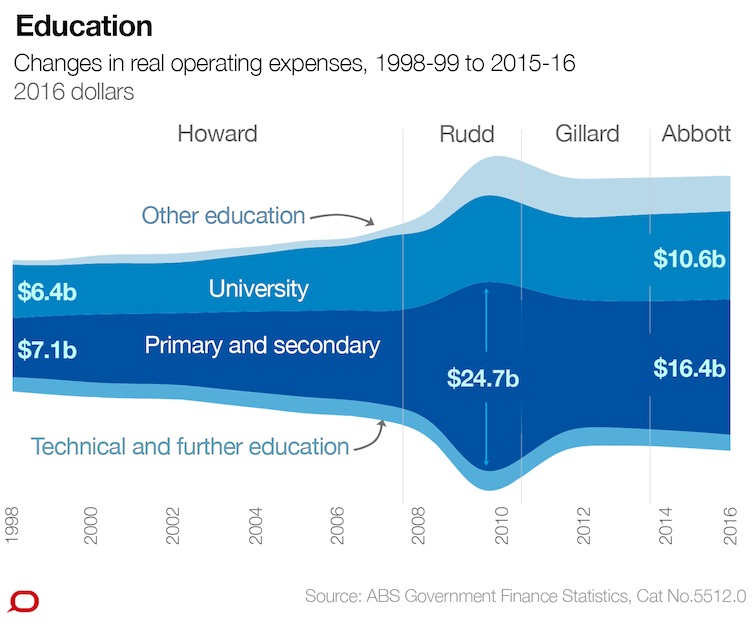 Australian Government expenditure on tertiary education has been consistently at 0.8% of GDP since 2000. There has not been a ‘blowout’ in tertiary education spending. If there is a problem, it is simply that the Government needs to bring the Budget back into balance. The contribution that can be made to that objective from the tertiary education sector is at best modest, writes Mark Warburton (LH Martin Institute).